Charles Krauthammer's Friday op-ed piece for The Washington Post was full of hypocrisy. The November election sent a clear message to Washington: less government, less debt, less spending. President Obama certainly heard it, but judging from his State of the Union address, he doesn't believe a word of it. The people say they want cuts? Sure they do - in the abstract. But any party that actually dares carry them out will be punished severely. On that, Obama stakes his reelection. No other conclusion can be drawn from a speech that didn't even address the debt issue until 35 minutes in. And then what did he offer? A freeze on domestic discretionary spending that he himself admitted would affect a mere one-eighth of the budget. Obama seemed impressed, however, that it would produce $400 billion in savings over 10 years. That's an average of $40 billion a year. The deficit for last year alone was more than 30 times as much. And total federal spending was more than 85 times that amount. A $40 billion annual savings for a government that just racked up $3 trillion in new debt over the past two years is deeply unserious. It's spillage, a rounding error. As for entitlements, which are where the real money is, Obama said practically nothing. He is happy to discuss, but if Republicans dare take anything from granny, he shall be Horatius at the bridge. Krauthammer attacks the president for not mentioning the debt issue sooner in his speech, but what do you suppose he would say about Republicans promising to address high unemployment as soon as they assumed office but instead decided to pass symbolic conservative legislation instead? Also, Krauthammer criticizes the president for not saying much about cutting entitlements, but if you recall during the health care reform debate Republicans tried to frighten seniors by pointing to a half trillion dollars in cuts to Medicare, and Krauthammer is guilty of feeding into the fear with his own Washington Post op-eds. However (life is a vale of howevers) suppose these provisions were bundled into a bill that also spelled out how the goodies are to be paid for and managed -- say, half a trillion dollars in new taxes, half a trillion in Medicare cuts (cuts not to keep Medicare solvent but to pay for the ice cream, steak and flowers), 118 new boards and commissions to administer the bounty-giving, and government regulation dictating, for example, how your steak is to be cooked. How do you think this would poll? 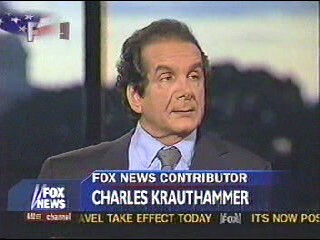 Krauthammer mischaracterized the Medicare cuts then and now that health care reform has been passed he has jumped on the other side of the fence and criticizes the administration for not cutting entitlements.